Finally my new studio is set up. In a fairly compact space, I’ve managed to squeeze in 21 linear feet of workbench surface and all the essential equipment for bookbinding and book conservation. Equipment includes a circa. 1895 Jacques board shear, Hickock lying press, Nilfisk GS80 HEPA variable speed vacuum, Hickock 001/2 book press, Schaefer S2 stamping press, Peachey manual board slotting machine, Altair spine stamping machine, and a Museum Services cold suction platen. Rereading Planning and Constructing Book and Paper Conservation Laboratories proved useful when thinking about my new space. It is borderline embarrassing that I even found my own chapter useful. I would like to add one bit of advice: although it is fun to think about the efficient storage of commonly used materials and tools, it is equally important to know when to stop theorizing and try things out for a while. The bench tops are all a double layer of 3/4″ maple faced plywood with at least a 2″ overhang for clamping. They are 37.5″ high, and the main bench 32″ deep. I decided to try the “other” position for the book press; the opening is positioned 90 degrees relative to the front of the mounting surface. This should make sighting critical alignments easier, ie. press board to book board edge. 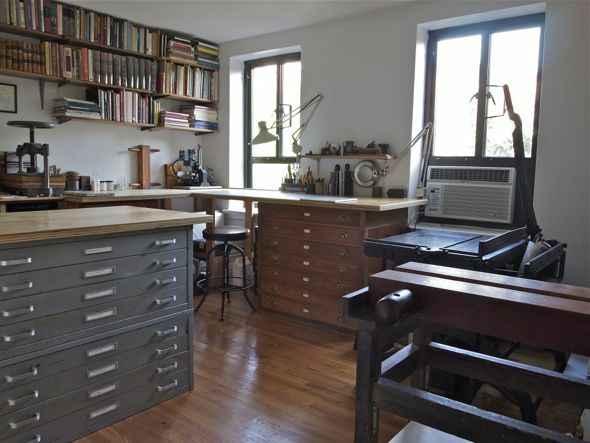 The island workspace on top of the flat files serves three functions: a convenient place to examine and discuss treatments with clients, a nice big desk for writing, and is great for natural light photography, since it is equidistant between two windows. My most used reference books are easily accessible. Soon, back to book work…. Well, my battle against entropy has just begun…. Looks beautiful Jeff. Love the windows and floor. 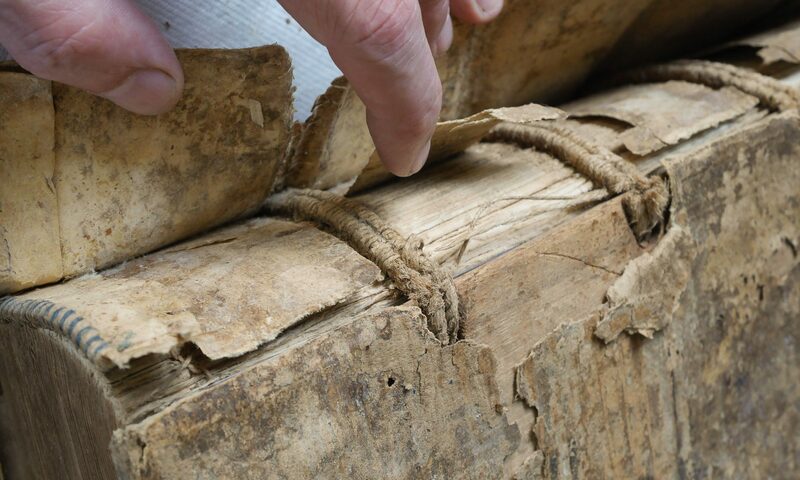 Happy binding. Dreamy. My workspace looks like it was assembled by caddis worms. What are your most used reference books? Just curious. I will post a list of reference books next week. Trying to design layout of my bookbinding area and would sure love to see more pictures of your work area from different angles. Very much appreciate the many fine tools I’ve bought from you.